Bullfight tickets to Hellín, Albacete, all bullfights organized in the Bullring of Hellín. 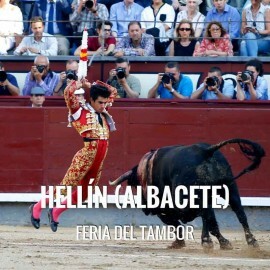 Festivities of Hellín in March and May 2019. Fast and secure online ordering. Immediate information of all the Bullfighting Festivals. A virtual store with the most powerful technology and design of the sector. Easy navigation, transactions with high security and confidentiality of data. 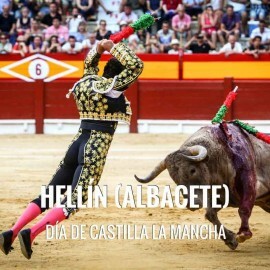 Hellín is to 63,6 km from Albacete (51 minutes' drive from Albacete). How to get here | Driving Direction. Feria del Tambor in March. (still needs to be confirmed). Castilla la Mancha Day: May. (still needs to be confirmed). Servitoro, Official Box office of bullfighting tickets sales at Hellín, Albacete bullring.